How to underclock base core clock? Discussion in 'Videocards - NVIDIA GeForce Drivers Section' started by grpm, Oct 20, 2018. Hi guys. I have a GTX 1050 (low-profile) with a dying fan and I need to lower its temperature, it's hitting 90+ °C while gaming, is it possible to underclock its base/stock core clock (1366 MHz)? I already undervolted it and limited its power with MSI Afterburner but it didn't help. If the fan is that bad, I would try cleaning and lube it, take off the fan, look for a sticker, carefully peel off and you should see either bearing hole or rubber cap over the hole. remove if cap if there and spray WD40 into bearing while spinning fan until it spins easy. Of course, you need to remove fan housing from GPU unit first. If the fan still doesn't work while cleaning it write down its model# and you might be able to Google a replacement. The fan spins and I already cleaned it, it's just very small and weak, if I'm not gaming it's fine because the clock drops to 139 MHz and the temperature is around 38-45 °C, I'm just worried of potential harm to the hardware when playing games at 90 degrees or more. How small is your case? Does the rest of your system get proper airflow and cooling? The rest of the components are fine and I have 120mm case fans with filters so it barely gets dusty, like I said, the card has a low profile fan that simply it's not enough. Why not just RMA your graphics card or get a replacement? I'm not from the US and it is practically impossible to do that where I am. Also if it is running that hot and assuming the fan is running well (if it's not none of this will help and I would be thinking of a way to "engineer" a new one with case fans and zip ties), I think I would *very carefully* remove the heatsink/fan and redo the thermal compound and make darned sure it is properly mounted. It's pretty common for them to do a crap job on it from the factory. Nvidia Inspector as mentioned above. 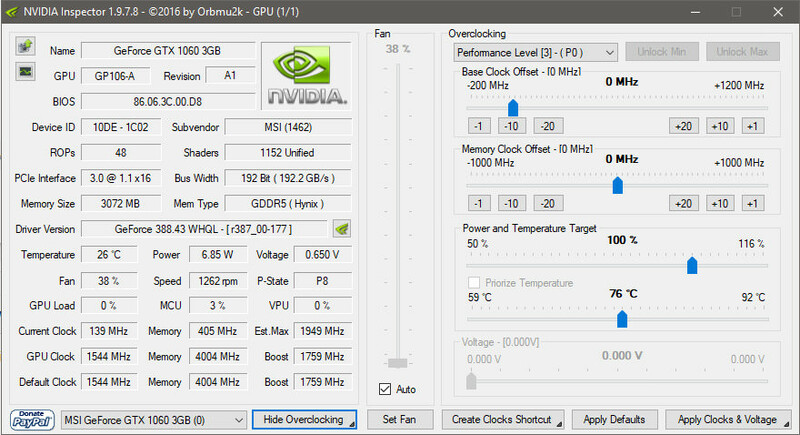 Hit the "Show Overclocking" button. Adjust "base clock offset' slider a bit (can hit the -10 or -20 buttons) and just drop it 20-80? Experiment a bit. I never found a need to fool with the power or memory, but I suppose you could bump them down a notch too if you really need it to cool off. Just hit the "Create Clocks Shortcut" button and move that shortcut to "C:\ProgramData\Microsoft\Windows\Start Menu\Programs\StartUp"
You'll probably have to make a BAT file (I put mine in the NV Inpector folder) with the info from the "Create Clocks Shortcut" tartget, then make a shortcut to that batch file in "C:\ProgramData\Microsoft\Windows\Start Menu\Programs\StartUp" because...Windows 10 is @#$% stupid. Clocks.bat (.txt file renamed to .bat) example with only the temp priority changed to 76. Change to what you like, can get the values from the target field of the shortcut Nvidia Inspector creates after you've made you settings with it. I did that MSI Afterburner, but it only affects the boost clock, when the GPU reaches the temp limit it doesn't throttle bellow the base clock, and my custom voltage curve gets overwritten in a bad way. Get another fan you can attach to the GPU to cool the heatsink until you figure out another solution. All simple. Just move "Base Clock Offset" slider to the left and press "Apply Clock & Voltage". Good news! I had enough and bought a cheap 40 mm fan to replace the stock one (50 mm), I also had to remove the GPU plastic cover and everything, I attached the new fan with a couple of cable ties and now I'm getting a max temp of 72° C while gaming, but usually it stays in the 60s, I had never been able to play with a full boost clock with the stock fan, really terrible design. Oh well, thanks for everything guys, until next time.